Senusret's son, Amenemhet III, reigned for 45 years and, like his father, he left a series of portraits remarkable for their individuality and fine work. His reign was the apogee of economic growth in the Middle Kingdom. Interest in the agricultural potential of the Faiyum increased, and a huge temple was erected to the local crocodile god, Sobek, at Kiman Faris where he is associated with the falcon, Horus the Elder. Above all, Amenemhet III exploited the quarries of Egypt and the turquoise mines in Sinai. There are more than 50 rock inscriptions in Sinai recording almost continual mining expeditions between Years 2 and 45 of his reign. It is a curious fact that, despite his long reign, there are very few inscriptions of Amenemhet III from Egypt itself: over 90 per cent are from outside the country, e.g. from Sinai. 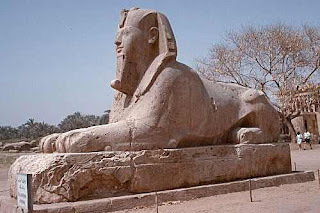 They do, however, give a valuable insight into his reign and provide long lists of officials and works in the quarries.